National heritage is something the French take very seriously. All through the country, more than 43,000 monuments are considered "historical" and protected as such. For most of them, whether castles, cathedrals, bridges or parks, this status and privilege do not come as a surprise. For some it does. Take for instance the EDF power plant in Jouques, located less than one kilometre south of the bridge in Mirabeau. Most of us drive by it every day. It's not just any 62 MW, three-turbine power-plant ... it is one with an architectural touch. Jean Crozet, is the architect from Marseille who designed the building and its strange, shark-like bridge crane, working hard to achieve perfect integration into the landscape. 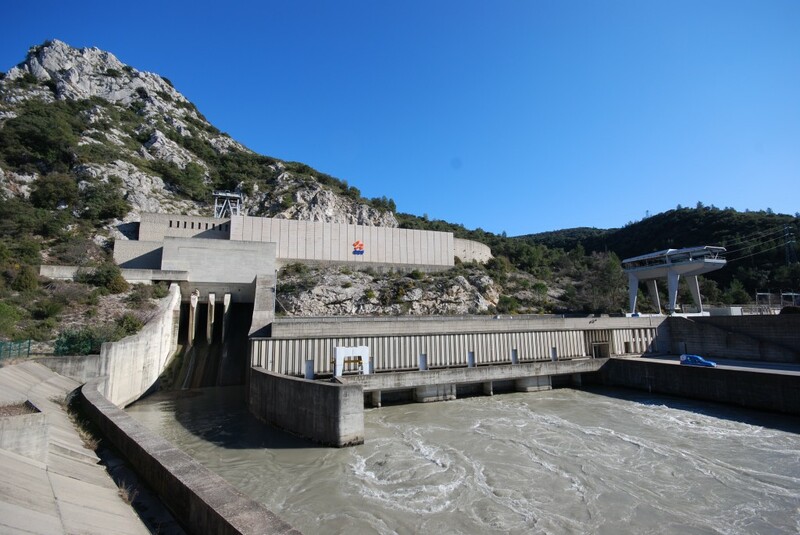 The plant was built in 1958-59 as part of the grand hydroelectric development project of the Durance Valley. It bears witness to this colossal work, which tamed the river, brought a regular flow of irrigation water to 150,000 hectares of agricultural land and provided the national grid with a yearly input of 7 billion KWh (25 percent of the PACA region's present electricity needs). For fifty years, the Jouques power plant has stood as a landmark on the road from Aix to Manosque. In 1989 it was declared a "Historical Monument" and in 2001 was awarded the label "Patrimoine du XXe siècle" ("20th Century Heritage").